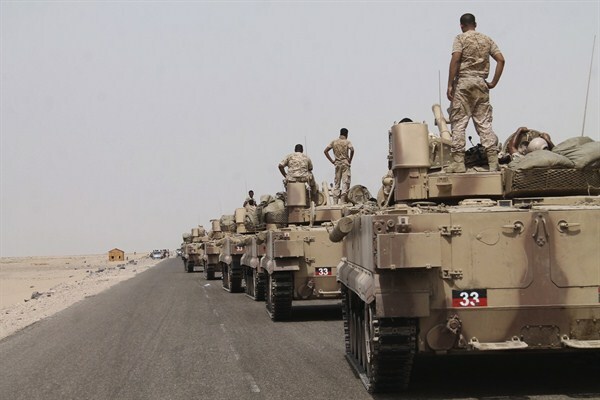 United Arab Emirates Raises the Stakes in Yemen, but to What End? Fighters against Shiite Houthi rebels stand on their armored vehicles on a road leading to Al-Anad base near Aden in the southern province of Lahej, Yemen, Aug. 3, 2015 (AP photo by Wael Qubady). Soon after the initial shock of Saudi Arabia’s military campaign in Yemen against Houthi rebels and military units loyal to former president Ali Abdullah Saleh had subsided, an important question arose. Would Riyadh, reorienting itself as an aggressive regional military force to be reckoned with—and no longer willing to ride on the coattails of the United States—put boots on the ground in Yemen?